The Golden Globe winner for Best Drama Mad Men has been largely overlooked by Australian viewers, due in part to limitations accessing it. The series set in a 1960’s advertising agency has already aired on the Movie Extra channel, and is available on Channel Nine’s website for around $2 a pop. Shame they didn’t air it given the show has gone on to beat Grey’s Anatomy, House, Damages, Big Love and The Tudors. It show also won an acting award for John Hamm. Movie Extra will be screening the entire first season again over Easter weekend as a Mad Men Marathon (Friday 21st March – Monday 24th March from 8:30pm – 11:00pm) . The second series airs later this year. Lead actor Jon Hamm set the tone for victory earlier this afternoon when he won MAD MEN’s first Golden Globe for Best Performance by an Actor in a Television Series, Drama – proving himself more golden than his fellow nominees Michael C. Hall (DEXTER), Hugh Laurie (HOUSE), Bill Paxton (BIG LOVE), and Jonathon Rhys Myers (THE TUDORS). MAD MEN then went on to win the big one of Best Television Series – Drama, beating out stiff competition which included GREY’S ANATOMY, HOUSE, BIG LOVE, DAMAGES and THE TUDORS. MAD MEN is a slick period drama following the lives of the men and women of advertising on New York’s Madison Avenue during the golden age of advertising in 1960. Created by Matthew Weiner (writer and EP of The Sopranos), MAD MEN acquired great critical acclaim in the US, which was echoed when it launched in Australia shortly after on MOVIE EXTRA. TV reviewers celebrated the slick production values, unique storylines, and the indulgences and indiscretions from a time when excess was part of doing business and political correctness wasn’t part of the office vocabulary. To celebrate MAD MEN’s victories, MOVIE EXTRA will be screening the entire first season again over Easter weekend as a MAD MEN Marathon (Friday 21st March – Monday 24th March from 8:30pm – 11:00pm) . The MAD MEN Marathon will also serve as a prelude to the premiere of Season 2 of MAD MEN, coming to EXTRA later this year. “We were the first channel outside of the US to acquire the series and broadcast the episodes concurrently with its US cable network, AMC. We always had great faith in the quality of MAD MEN and the unique offering it brought to television, so we’re elated that it has been acknowledged with a double Golden Globe win. Our congratulations also go to Matthew Weiner, Jon Hamm and AMC. Another of MOVIE EXTRA’s quality dramas that was given a Golden Globe nod for Best Mini-Series or Motion Picture Made For Television is FIVE DAYS: a British mini-series TV event which examines the aftermath when a mother and her young children go missing. Starring Hugh Bonneville, FIVE DAYS originally premiered on EXTRA as a five-day TV event, but will be re-screened all on one night on Sunday 27th of January from 6pm – midnight. Mad Men is a awesome series Set 1960 to 1963 highlites the fashion & lifestyle & US history of its time view it on DVD with out ad breaks & it gets under your skin! Really well made & a bloody clever script. 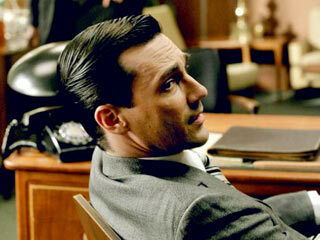 When will Season 3 of Mad Men start? have u heard of a dvd recorder or vhs recorder??? try this… read the tv guide and see what time the program is on…then set the timer on the recorder…. opps sorry maybe u dot know how to do that! i love the sorpranos! one of the best dramas of its time. stayed up to watch it all the time, but yes nine did put it on late. oh well they will learn. I doubt very much nine would air it(I don’t think any of the FTA channels would bother with it), another one of those made for cable shows(entourage,deadwood,dirt,the riches etc)that won’t ever appear on FTA. Look at what nine has done with other Cable shows like the sopranos or west wing, treated them badly, so much so they ended up either airing late at night or being handpassed to other channels. Any chance Nine will air it? Looks very good..almost like a dramatic version of McMahon & tate! maybe that guy has a problem reading! lol what the guy fails to see is that most of our tv content is from the usa! duh! It’s actually on Aus TV as the headline indicated and therefore relevant to this blog. Cheers. Theres no limitations getting to the show, its all over the net like a plague. Maybe, amazing as it seems, its just not that good a show to Australians. Just because it did well in the US don’t mean it will do well here davo.. Cover Aussies popularity, not the US and you will rise in the blog charts. air this program!! for god sake! !